For the arrival of the Centre Pompidou Mobile in Le Havre's Caucriauville district for the exhibition "Cercles et carrés" from February 23 to May 22, 2013, MuMa is lending the travelling museum a work from its collection by François Morellet:Sphere-Grids (1969). To create a link between the two structures during the exhibition, MuMa will, in cooperation with the artist, display a recent work by Morellet: Lamentable. The artwork is formed of 8 neon rod arcs of a circle, 8 metres in diameter. The 8 arcs are connected to one another and suspended from the ceiling, hanging "lamentably" and spreading over four metres, in constant communication with the lines and open spaces of the museum. François Morellet, born 1926 in Cholet, is one of the great figures of geometric abstraction and a precursor of Minimal art. Since 1952, his work has been based on simple systems that introduce an element of chance with the aim of minimizing the artist's subjectivity and choices. 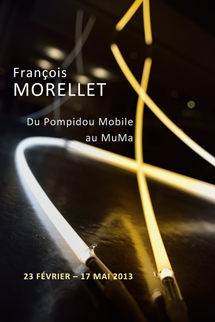 Using a variety of techniques, painting, sculpture and neon rods, Morellet also works with architecture. The result is an art of limited means and often light-heartedness described by the artist with a touch of humour: from Defigurations to Architectural Disintegrations, not to mention the stained-glass window at the Louvre entitled L'Esprit d'escalier[staircase wit], the work of Morellet can also be seen as the result of art conceived of like the rules of a game.